❶The jar for the lungs had a human head, and was called Imsety. Kings and queens in Egypt were called pharaohs. Cleopatra VII ruled; she was the last pharaoh. Egypt became a part of the Roman Empire. It took a long time to make papyrus, but it was easier than carrying around heavy clay tablets, which is what they did before. They wrote in pictures called hieroglyphics. Each picture means something so when you see a few different kinds of pictures in a row, you know what the writer is trying to say. The Egyptians used pictures for writing numbers too — different pictures stood for units, tens and hundreds. The Egyptians were very advanced at maths — they figured out how to work out tricky problems that helped other people after them understand more about maths. In fact, people who lived in other countries even knew that the Egyptians were the best at maths! Egyptians would shave their heads and wear wigs instead! Egyptians loved perfume, and would wear it in solid cones on their head — the cones would melt during the day and keep them smelling nice when the weather was very hot. The make-up they had included black and green to wear on their eyes and eyelashes, and rouge for their cheeks. Look through the gallery below and see if you can spot all of the following: Some of the machines they used are: It went like this: Pharaoh — The pharaoh was at the top of the order, and thought to be a god. Nobles and priests — Nobles included doctors, lawyers and military leaders. Priests were the ones who made sure the god in their temple was happy, and that they understood any messages the god was trying to say to them. Scribes and soldiers — Scribes were the only ones who were taught how to write; people in other professions like priests may have studied to be a scribe as well, but they could also have just hired someone to write things down for them. Being a soldier was a choice; they were given land to live on after they finished serving in the army. Craftsmen — This was a large group that included anyone who had a trade, such as potters, tailors, painters and blacksmiths. Farmers and slaves — The pharaoh and nobles hired farmers to work for them, and grow crops on their land; as payment, the farmers had a place to live, clothes to wear and food to eat. Slaves were people who were captured in battles with other civilisations, and they worked in the homes of the pharaoh and nobles or in temples. See objects found in the tomb of Tutankhamun Watch this video about writing used in Ancient Egypt. Find out about living near the Nile , and farming techniques used by Egyptians today. See how farming worked in Ancient Egypt. Villages grew as the land was good to farm along the Nile River because every spring the snow would melt from the mountains and in July the river flooded. After a few months the water would leave the land with rich, fertile soil which was excellent for growing onions, garlic, leeks, peas, beans, cucumbers, grapes melons, pomegranates, figs and dates. Over time the villages along the river joined together and became two kingdoms, called Lower Egypt and Upper Egypt. The two kingdoms fought a battle. King Menes of Upper Egypt won and the two kingdoms joined and a capital city was made called Memphis. The first Egyptian kings arranged to sell the food they could grow throughout Egypt. To communicate and keep records of this they invented hieroglyphs which was a language using symbols. They would write hieroglyphs on walls and paper scrolls. The Egyptians built huge pyramids as tombs for their kings or pharaohs when they died. There are over 30 pyramids in Egypt, but the most famous ones are at Giza, where three pharaohs and their chief wives are buried. The largest pyramid is called the Great Pyramid built for Pharaoh Khufu. It is m high and is built with over two million stone blocks. You have to remember that there were no cranes or machinery in Ancient Egypt so building a pyramid of this size by hand is a truly amazing and incredible. The Egyptians tried to stop dead bodies from decaying. They believed that if they mummified a body and protect it in a pyramid the person would live forever in the afterlife. They did this by removing all the internal organs and brain. The inside of the body was dried and stuffed with linen, natron, sawdust and sweet-smelling spices. The body would then be put into two or three human shaped coffins, one inside the other. The Great Pyramid is the largest and most famous of the pyramids. It was built for the Pharaoh Khuf. It is over metres high and took 20 years to build. The Sphinx stands in front of all the pyramids in Giza. It has the body of a lion and the head of a pharaoh. Ancient Egyptians were buried with their belongings and the tomb walls were painted with scenes from the dead persons life. By examining the objects artifacts and paintings in the tombs, we have been able to understand a lot more about life in Ancient Egypt. 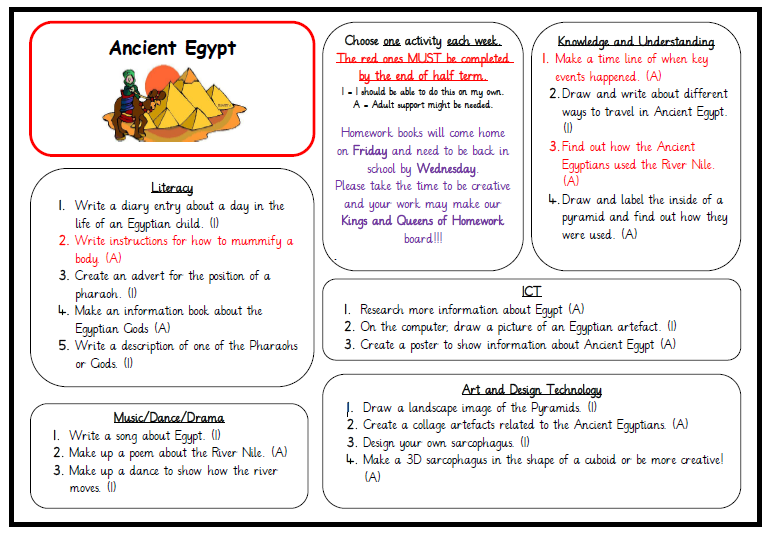 We can learn about how the Egyptians lived by looking at the objects stored in pyramids ready to be used in the afterlife. In this painting we can see some of the animals they kept. The Egyptians believed that when they died, they would make a journey to another world where they would lead a new life. They would need all the things they had used when they were alive, so their families would put those things in their graves. Egyptians paid vast amounts of money to have their bodies properly preserved. Egyptians who were poor were buried in the sand whilst the rich ones were buried in a tomb. Find out more about mummies and the afterlife. See inside a tomb Wow! See the colourful tomb paintings.